Highsec is an amazing place, filled with ships that make impressive explosions. Let's celebrate some of the outstanding killmail fodder from March 31st @ 00:00 EVEtime to April 6th @ 23:59 EVEtime. No, that's not a typo. 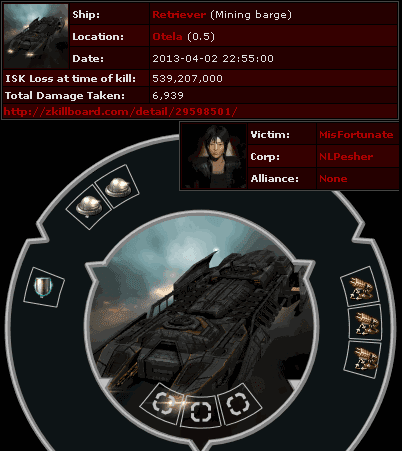 The aptly-named MisFortunate managed to lose a Retriever worth over half a billion isk. I wonder how much help that officer mining laser upgrade really did? Apparently not enough to dissuade the carebear from mining AFK. Agent Keikira Otsada delivered the punishment. 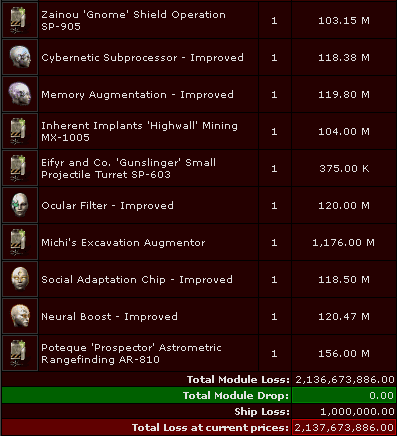 This week's pod loss, belonging to M 13 (a bot-aspirant name if I've ever seen one), cost 2.1 billion isk. Whoever this "Michi" guy is who invested the Excavation Augmentors must be making a lot of money. Agent Ziaeon crushed the pod after he and Renyah Atori stripped away the Mackinaw that held it inside. It's the feel-good story of the week! Rebel Astesia attempted to protect Code violators in an ice field by standing guard in an ECM Scorpion. There was only one problem: The rebel allowed herself to get too deep in the culture of bot-aspirancy, and "went native" by going AFK for an extended period. Knights NoseCandy, Capt Starfox, John E Normus, Galaxy Pig, Wescro2, Thunder Rushing, Pestario Vargas, R0me0 Charl1e, and Galaxy Chicken rushed in to kill the rebel. Her 1.1 billion isk pod was then popped by Capt Starfox. Meanwhile... In a continuation of last week's post, Fawn Tailor killed stheorykim's Noctis, with the same fitting, in the same system, for the third time. Can't they program a bot to move one jump over? Another victory for our valiant Knights against the hordes of bot aspirants! the very pinnacle of forever alone. For someone who claims to be their saviour, you seem to know very little about mining: there is no such thing as an "officer mining laser upgrade". Aoede Mining Laser Upgrade is the Meta 4 version. James315 is the savior of highsec, and not the savior of miners, except indirectly. No normal person should be concerned with Buying expensive modules to mine. If mining is absolutely required, buy some t2 modules and be done with it. For someone who claimed to be the Savior, Jesus seemed to know very little about the details of how prostitution, gambling, and excess drinking actually worked: "A French Whore" is a drink with vodka, Chambord, and pineapple juice. "A french whore" is a whore from France. He ordered one and got the other...but which did he order and which did he get? This simple analogy reveals that Anon 11:54 pm is not only a filthy rebel, but a closet Satanist who hates Jesus and puppies and Freedom. Shame on you, puppy-killer. I kill puppies if they afk-mine, just as you should. I understand what you fellas are doing but at the same time I do not see why it is necessary to pod as well..surely losing a ship is a punishment enough to get the point across? Excessive actions spring to mind. You see it's not punishment, it's teaching, and education it's always expensive. If you let your pod float in space, do you deserve to keep it? "If you let your pod float in space, do you deserve to keep it?" Only if you are lucky. Are you feeling lucky? Podding is half the fun, and the New Order would never deprive its Knights from having fun. OK I'm still fairly noobish so maybe someone can help me out here, but on the Scorpion, wouldn't signal distortion amplifiers have been a better choice for low slots? Why core scanner probes instead of combat scanner probes? Why not ECM bursts instead of the enfeebling phase inversions since EPIs are fairly useless against Gallente ships and Scorpions get a ECM burst bonus, and would have helped more when you came after him? AFAIK Hybrids aren't all that cap dependent, so why so many neuts? Maybe some smartbombs there in case he got attacked? Why not sit there cloaked until you entered the system? Granted, since apparently the ECM pilot was AFK during the attack it's all pretty academic, but as a newish player, I'm curious what you guys think he should have done differently...besides being ATK lol. Doesn't need amps because its rather easy to jam destroyers. Cats in particular have a baseline 11 point magnometric signal strength. Using the range because it wants to be able to cover the entire icebelt, some of which are up to 350km wide. Core probes likely because he's not trying to lock down on a target, rather, he wants to have general information of the comings and goings of things in the system. He has no need to scan lock a target, he just wanted to have a heads if the gankfleet was doing its thing elsewhere. He does have mostly ECM, but he stacked on a few EPI's in case we threw thrashers at him. Not a dumb decision. Got me on the neuts, smartbombs would have definitely been the best idea. Sitting cloaked is what a skilled pilot would do. A skilled pilot also wouldnt afk. Teaching? are you on drugs, or retarded? He needed combat probes to detect ships of any kind with the scanning interface. Smartbomb range is very low and you might inadvertently catch GCC with them in the ice belt - I think neuts are the right choice. Scorpion locking time is pretty poor (though I don't have the specific number on hand). Are your agents not talking to each other? Or do you simply prefer to believe that I was afk? The reason you managed to kill my pod, is probably because I was on a horribly slow internet connection at the time, involving antennas and stuff. It would often take 2-3 seconds from module activation to I would see the module turning on. I tried warping away, but my pod was gone before it even spawned. How long does it take for those catalysts to lock a pod? When it comes to my fit, I had never really used ECM modules before when I put the fit together. And I assumed that I would not need much tank because I would be able to just jam whoever attacked my scorpion. But because I got so surprised by being attacked, I completely forgot to even start my jammers. But if I had, my connection would probably have given them several seconds of delay. Another detail is that for some reason I had just stopped orbiting right before the attack as well. So there were quite a few things that made the attack much easier to carry out. I didn't use signal distortion amplifiers because I had completely missed them while browsing the market. So thanks for informing me about their existance =) The probe launcher was for scanning down interesting sites for other miners in fleet, it had nothing to do with gank protection. I have no experience with ECM burst, but if it works like smartbombs, it would be a bad idea to use it while close to neutral ships. I have heard that 2 neuts can cap drain a catalyst completely very quickly, and I can keep 4 of them going longer than the catalysts can survive, so being cap stable doesn't matter. Cloak messes with locktime, which can be a very bad thing when a few seconds can make a big difference. Smartbombs would of course be very fun to use effectively in such a situation, but it can very easily be countered by the gankers just bringing a neutral ship causing me to concord myself. The drone link is there to give me 84km drone range, which fits perfectly with my 84km orca tractor range. Lastly I want to say that I succeded in protecting the miners, they didn't get attacked. And if gankers keep targeting my scorpion, they will probably need to spend more isk killing it than I need to spend replacing it. However, it would be interesting to see how many catalysts they would need to kill my scorpion now that I am better prepared, and also on a fiber connection. I could probably use the training as well. I can't find their link for recommended Gankalyst fits, but IIRC one of the medium slots was a sensor booster with scan resolution script for faster lock time...presumably for killing pods. 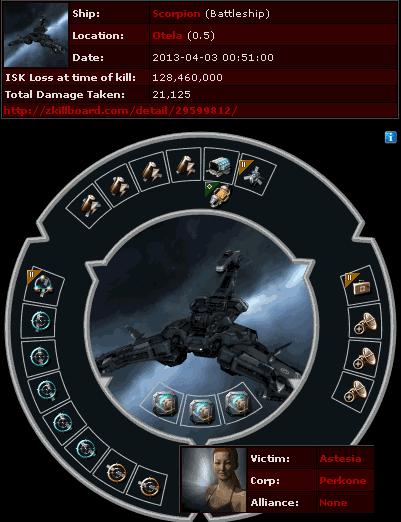 AFAIK ECM bursts are like smart bombs, but if your Scorpion was in the same corp as the Orca, you don't have to worry about getting Concorded for burst or smartbombs hitting it, do you? Yeah I suppose if the NO gang brought neutral ships you couldn't use either, but what fun is it for them to go to a gank party as a neutral? If you were parked near your Orca cloaked, I figured it would be best to be cloaked until they arrive in system, and then you could have decloaked as you got even closer to your Orca and use ECM burst until your sensors were clear to lock on with your targetted jammers if they had already opened fire on the Orca, but again, I'm too noob to know if that would have actually worked that way. IIRC their typical Gankalyst fit is about 5M or even less, so they still most likely came out on top on that gank, but losing a 130M scorpion is still better than losing an Orca, I guess. I think James wrote that you were afk because he doesn't know the exact circumstances of every killmail, so he just fills in the blanks with something that would be entertaining to read. ECM Bursts are like smartbombs - if you hit a neutral by accident, you will receive a Criminal flag and lose your ship. Hitting corp-mates is okay (and encouraged!). I would not use either of these in the icebelts. I agree with your choice of neuts - I'd even swap the hislot drone module you have to another neut. I like your choice of racial ECM jammers (though I'd drop the ladar). Scorpion is wonderful for range, but it has a slow locking time on small targets like destroyers. One thing you might try is putting remote sensor boosters on your Orca and projecting those onto your ECM ship to help it. Personally, I'd just use a tanky blackbird (with a spare held in the Orca incase they do gank it). A signal distortion amplifier offers bonuses to both ECM range *and* ECM strength in a single low-slot module, freeing up two rig slots for other purposes. You sound like a great player - I'm sure you'd always be welcome to fly with the New Order if you wanted to look from the other perspective! =) All the best \o. Cool to hear from someone that isn't emo raging! It is hard to say the best setup for any of these defense fleets because at the end of the day you are always at the disadvantage. The NO can easily scan you down and see how you are fit and adjust accordingly. That said if the purpose of this ship is to protect the shiny mining fleet then bursts would be my weapon of choice. Sure you may get a GCC but you will most likely stop their gank successfully loosing only what you are already laying on the line, the same way they lay out cats. As mentioned though a cheaper option is probably more viable for this sort of protection. While many will say the bursts are ineffective as they have limited range you must keep in mind that so do the cats. They need to be ideally within 2500 or less of you to do their work. So grouping your fleet would be required. Which leaves you open to smart bomb pilots. Not much to worry about there though if only NO is hunting in the belt. Thats not to say they couldn't reship some longer range ships take care of the ECM then go for the fleet though. As mentioned earlier though the NO always has the upper hand in this game. Best of rule of thumb I would say for the NO is not to be the slowest gazelle of the pack. actually their fits were a bit more expensive than 5m just look at T2 guns price. on top of that the dessies (dieing to concord) cant be insured whereas the bs can, looking at new order fitting and ship losses I think could be turned to a point the bs looses less, not counting the time it takes to assemble a small gang, the 15 minutes each account must sit in station afterwords and the potential risk of failure. the only chance at a "win" for the gankers was the pod, most likely that has been remedied. After this comeing expansion the gap will widen further as teir 1-2 bs are getting buffs across the board in HP. the "new order" could potentially have a good base for killing BOTTERS but as it exists today its a sad attempt at bullying that will ultimately fail. sweet posts from your dear leader and a mob mentality may keep moral up, but the effort you put forth will not prevent the mineing of empire and wont even SCRATCH the known botters of null that are under the protection of the power blocks. I checked with EFT, and it seems a catalyst with 1 sensor booster can lock a pod in about 2-3 seconds, which should be enough to take advantage of my slow connection. I keep all my ships close, because then I can make sure that my skiffs remain within targeting range of my scorpion, to keep their remote sensor boosting going. 4 skiffs with 2 remote sensor boosters each can boost a scorpion to max scan resolution around 639 mm, which mean that the scorpion can target a catalyst in 2-3 seconds. Add another booster with range script, and you get 250 km targeting range as well. I use jam range rigs because I want to be able to reach the whole belt from 1 spot, and with my current setup my jammer tooltip says range within 229km, which is pretty decent. The skiff have such an amazing tank anyway, so you can easily affort to use some midslots for utility like this. I had all my characters in my own corp, but when I got 3 wardecs on one day, I decided enough was enough, so I am now staying in NPC corps. So using smartbombs or ECM burst would be generally a bad idea in my case. If I stay cloaked with maxed skills, I would as far as I can figure out, not be able to lock anything for 10 seconds after decloaking. And looking at the T2 cloak, it says -40% scan resolution, which might mean that it would now take about 4 seconds to lock a destroyer. There are plenty of retrievers and macks that can be popped during those 14 seconds. And those 14 seconds will most likely be 16 seconds, because cloaking lvl 5 takes a long time to train. And I feel that it is actually an advantage to stay visible, because it can discourage gankers even when I am afk. Of course it would be fairly easy to gank my scorpion when I am afk, but then they would need to figure out exactly when that would be the case. I like the drone range because I use the scorpion to clear out rats, as well as 1 salvage drone on autopilot. Sometimes the rats drop faction loot worth 50-150 mill. I probaby would use signal distortion amplifiers if I had not decided to go for tank in lowslots now. It is indeed hard to say the best setup for this kind of thing, I have decided to just do some trial and error and see what happens. I do plan to stuff some ECM griffins or something in my orca, just to keep at hand. And now, after playing more than 5 years, I have insured a ship for the first time ever :P Thanks for reminding me about that as well! =) I do however believe that the reason I got around 500 mill in donations from my fleet, was in large part because of my pod. The next pod wont be as expensive, so the potensial for donations might be lower. For some reason I still cant say for sure that I have ever seen a botter... But Im sure they exist somewhere, as even CCP talks about them. Botters do indeed exist, as I learned during my ninja salvaging days and observing mission runners. The main point I would take from Astesia’s note and also from talking to her is that the Scorpion did achieve its objective, which was to protect the miners. It's worth noting that despite Otela being a 0.5 sec ice mining system and next to the centre of James 315's latest declared target - hardly any ice miners have died there, and I suggest Astesia's fleet is in large part to do with that. ECM has proved and continues to be a very effective anti-gank tool. For those not wishing the outlay of a Scorpion or with low skills but looking to defend miners a humble Griffin is also very effective; because of its low cost and high base scan resolution for fast locking. A Griffin can fit a cloak and yet lock quickly enough to jam a fair number of catalysts - enough to defeat even quite large ganks (usually just knocking out 40% of a gank dps will cause a gank to fail). However, if using a cloak you do have to de-cloak in advance of an attack because of the targeting delay, which means using d-scan quite a lot. The other aspect of a Griffin and/or its tech 2 variant the Kitsune is a high agility and warp speed at 6 au/s as opposed to a Catalyst at 3 au/s. This makes it an effective belt patroller with the ability to intercept ganks across belts,while the ability to stay cloaked can make it an unseen threat, that affects gankers at a psychological level.